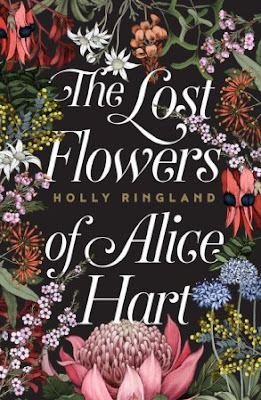 Given the amount of buzz that has already surrounded the release of Holly Ringland’s debut novel, The Lost Flowers of Alice Hart, it would be unsurprising if the book did not live up to the hype. In recent years, booksellers and reviewers have seen the promise ‘the most exciting debut of the year’ emblazoned on numerous covers, and have collectively thought, “surely that cannot be true for all of them.” But when it comes to The Lost Flowers of Alice Hart, the only disappointing thing about it is that readers will have to wait until April 2018 to experience it. The Lost Flowers of Alice Hart tells the story of Alice Hart, who goes to live with her estranged grandmother after a family tragedy. Traumatised, Alice takes solace in the assortment of women who live at her grandmother’s property, Thornfield, where native flowers are grown and the Victorian art of floriography—or communicating through certain floral arrangements—is practised. The women (and dog) at Thornfield become Alice’s family, and under their care, she grows up and takes her place in a long line of women from Thornfield who have loved and lost fiercely. Partly set at beautiful Thornfield, a sprawling inland property with a river at its heart in more ways than one, and partly set at a National Park in the Northern Territory, Alice’s story is one which is bound up in the language of Australian native flowers, their hidden meanings, their connection to Australia’s history, and the people of the present day. But perhaps the best thing about The Lost Flowers of Alice Hart is that it is a story about stories. The flowers tell stories, and help Alice to communicate when she cannot find the right words, but storytelling also makes appearances in other forms. There is family history running through this book, and the reader gets to know (albeit briefly) four generations of Thornfield women, as well as the histories of The Flowers—the women who call the property home. Then there are story books and fairy tales. For Alice, books have always been a refuge, and discovering the town library is a turning point in her young life, a way of taking back some of her independence. When she moves to the National Park and has to make her home feel more like her own, one of the things she does is to furnish it with as many books as she can afford, bringing to mind the CS Lewis quote—“When I get a little money, I buy books, and if there is anything left over, I buy food.” Fairy tales and classic stories are alluded to everywhere in this novel, from the allusions to Jane Eyre made subtly by the naming of the flower farm, to the not so subtle hints at Alice being named after the heroine in Lewis Carroll’s Alice in Wonderland. For anyone who has found a friend in stories, or an escape, or whatever they needed, Alice’s story will be a familiar one. She is a heroine to fall in love with, to root for, and to care deeply about. This is a novel written with love and with a skilled hand. It is whimsical without being silly, magical without being far-fetched, beautiful without being filled with purple prose. I adored it, and I cannot wait to read it again in April.